WEB-MINDSCAPE joints the aspects of social networks (Twitter), surround sound, brainwaves and visual elements in an interactive/immersive audiovisual installation (light and sound), whereby visitors interact with the audiovisual environment by using an EEG interface, which reads their brain activity and triggers the interaction. The immersive audiovisual environment is site-specific, where the visual element consists of light produced by electroluminescent wires (EL) and sound (e.g. from Tweets) is diffused in surround octophony. Visitors (one at a time) are connected to an EEG interface (Emotiv Insight), which is continuously measuring their brain activity whilst listening to messages via Twitter from all over the world. A community is invited worldwide to joint a Twitter account. 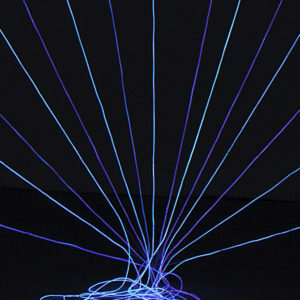 The visual environment is created by light structure made by electroluminescent wires (EL wires). This wired structure is built according to the characteristics of the space. The EL cables glare when applied to an alternating current (AC). Hence, once the AC has been activated, the data of the subject’s brain waves from the EEG interface is utilized in order to turn on/off different cables and in different tempos. The subject will be immersed in this luminous structure, surrounded by light cables and by surround sound. The sound section of the work consists of a surround soundscape (with up to 8x independent audio channels) which changes depending on the information coming from the EEG: when the subject is in a relaxation state, the sound creates a balanced and subtle soundscape; when, on the other hand, the subject’s relaxed condition is altered by the messages received from the outside, the sound combines words coming from the instant tweets in real-time, creating a sonic environment made of words and which increasingly becomes more chaotic according to the data received from the brain activity. Her work is constantly featured in not only media and sound-based festivals/conferences but also in group and solo exhibitions around the globe, for example, the ZKM Center in Karlsruhe; KIBLA Multimedia Centre in Maribor, Bauhaus Museum für Gestaltung Berlin, the International Computer Music Conferences ICMC in Copenhagen, Montréal and Utrecht (2007/2009/2016); Festival Internacional de la Imagen in Manizales (2009/2010/2013), ESPACIO Fundación Telefónica in Buenos Aires (2010), DRHA2010 Festival of Sensual Technologies in London (2010), the New York City Electroacoustic Music Festival NYCEMF (2010/2013-2016); the SIGGRAPH Asia in Yokohama (2009); the Re-New Festival in Copenhagen (2011); the New Interfaces for Musical Expression Conference NIME in Oslo (2011); ISEA 2011 Istanbul, at CAMP Festival – 55th Venice Biennale Prohelvetia – Salon Suisse (2013), Audio Art Festival Cracow (2013), CMMR Symposium on Computer Music Multidisciplinary Research in Plymouth and Marseille (2013/2015), at Harvestworks Digital Media Arts Center New York City (2014), at the Museum of Contemporary Art Bogotá (2008/2015), at MADATAC 07 Madrid (2016), Sound/Image colloquium in London (2016), IK Stichting Vlissingen (2016), Digitale Duesseldorf (2016) and more recently at Sonic Visions Reutlingen. – Though it sounds nerve-wracking to have your internal, private feelings projected to a group of strangers in an art gallery, Robles work is fascinating in that one person’s emotional barometer can change the mood and environment of a big space—a chance to become Zeus, of sorts, in Chelsea. This installation was developed during a residency at the IK Foundation Vlissingen (The Netherlands) and was technically supported by Andreas Gernemann-Paulsen from the Institute of Musicology – University of Cologne (Germany).